It's been too long yet again since your host last updated these pages. He's not dead, and neither is this blog, but the thrust of his work hasn't been linguistic lately, which has made coming up with ideas for a linguistics blog fairly difficult. What has he been working on? Technically, he ought to be waiting for the press release, but that seems to have been lost in a blizzard of bureaucracy months ago. So if you really want to know, click here. This is the same project responsible for all East Coast trips you've heard about, and a few more that you haven't. There are language issues involved, to be sure, including the delightful problem of Section 508 (which gives SC a badly-needed idea for a post), but they tend to be practical issues of website design rather than anything all that exciting. Website design? Yup. That and the world's worst idea for software architecture. It's not exactly the sort of thing SC readers want to read about. And for that matter, it's not the sort of thing your host wants to write about. There is, however, a large backlog of software to finish developing for this site, and some fresh ideas to take off in the new year. So with thanks to Radagast for getting your host back in gear, we'll try to get this show back on the road. Your host will be on a plane to Washington, D.C., early this morning, and expects to be on the East Coast until Wednesday afternoon. While SC has not been given permission to say exactly what is suddenly responsible for all this travel, suffice it to say that the proposal he spent so much time on over the summer turned out to be a winner. If/when an official press release is issued, readers will be directed to it at that time. In the meantime, if readers have any suggestions for anything -- ANYTHING -- to do in Tyson's Corner, Virginia, other than counting the seconds until it's time to leave, please feel free to post them here. Ditto if you happen to know who Tyson was, and what he was doing in a corner (but please, no lame references to Kid Pop-Cap, as in this New Yorker piece). Every James Bond film has ended with some variant on "James Bond Will Return", although the degree of certainty involved has varied greatly. Suffice it to say that the uncertainty spiked when Sean Connery initially quit, again when Roger Moore quit, and looked damn near hopeless when Timothy Dalton was allowed near the role. Things were looking Daltonesque when this went up, that's for sure. However, the evil sleep-eating proposal officially ended on Friday afternoon ([for you, bub -- luckless oral presentation-giving manager]), and it's time to reward my loyal readers -- both of you, judging from Site Meter -- for your suffering. So here's the deal. For a long time, your host has been threatening to go wine tasting in Santa Barbara. This weekend, as a reward for a job overly done, that's exactly what's happening. A full review of Rebecca Goldstein's Incompleteness, which is as good as advertised. Better, really. Notes on the sociolinguistics of teleconferences, payback for all the ones SC sat through over the last three weeks. An all-new page which was promised some time ago, but needs just a little debugging before it's ready for prime-time. Putting off this post hasn't made it any easier to write, so here goes. Readers have been aware for some time that your host lives in Orange County, works in San Diego, and was facing a move to Los Angeles. Last week, the move to L.A. mostly took place -- the "mostly" referring to the surprisingly large number of things that your host and Mrs. SC didn't want going either because they were too fragile to let the movers handle, or because there simply isn't enough room in the tiny Victory Mansions cubbyhole that we're in now. So there have been additional trips to handle some of this stuff, as well as dispersing it among family members who have generously offered to host some of SC's junk. Complicating the move was the need for your host to be in the office much of that week in order to handle a major delivery to a customer. To add to the excitement, on Thursday of last week, your host was invited to join in the largest proposal of his working career. It is, alas, not at all linguistically oriented, but it would guarantee the full funding of his position for five years, and make it considerably easier to pursue the R&D projects that he wants to be doing. It would also be a major coup for his managers, who hopefully will remember what demands they are making on him right now at bonus time (which, conveniently for them, is half a year away). Unfortunately, this has also required a lot of time in the office, and 15-18 hour days endlessly writing, reviewing, and rewriting proposal material from a very large team. The amount of time left for sleep has been disturbingly minimal, and the time for blog reading and writing simply nonexistent. So that's where SC has gone, and will probably remain, even over the "holiday" weekend, for another 5-6 more days. Your host will try to get a few things out between now and then, but suffice it to say, this blog is far from dead, just on an unplanned and nearly done hiatus. SC's paternal grandmother had always hoped her son would go to medical school, as most Jewish mothers do. On the day of his graduation, she was thus heard to remark to SC's aunt: "Do you think it's too late for him to go to medical school?". The first Jewish president of the United States has been elected. His mother is interviewed at the swearing-in ceremony, and asked how it feels to be the mother of the first ever Jewish president. She replies, "Alright, but let me tell you about my other son, the doctor." So, we've finally got a doctor in the family. Congratulations, Mrs. SC, M.D.! Writing about the National Spelling Bee reminded your host of his own near brush with the event from a number of years ago. In 8th grade, SC won his junior high school's spelling bee and got to take a trip to the San Diego county bee. At the time, the county event was governed by the same rules as the national one (this may still be the case, but I'm not researching it because it's not relevant). This was true with one critical exception -- on the day of the event, the organizers changed a rule at the request of a participant before the first round began. Normally, a contestant could request a number of facts about a word before spelling it -- meaning, usage in context, and any root words. If a word had no root, the then-current national rules still required the contestant to attempt to spell it. However, the judges decided to alter the rules, and throw out any word that they couldn't provide a root for -- but only if the contestant asked for it. Your host was upset at this decision, since that wasn't what he'd had to play by before, but didn't challenge it. Finally, there were five contestants left, including SC. In the round known forever within Chez SC simply as "The Great Catastrophe", the two people whose turns immediately preceded SC's managed to get words thrown out on the root-word technicality, both of which your host knew how to spell. Then it was his turn. The judges came up with something pronounced like "coop-RUH-SIN-ee-ous". Never having heard it before, SC panicked. "Uh, definition please?" "Having to do with cypress trees", replied the judge. Uh-oh. Your host didn't think to ask for a root word. He tried to spell it ("cuprecineous"). He lost. There was not another word asked for the remainder of the event that SC didn't know how to spell. But it was too late. Sometimes, well-meaning people will suggest that SC take to a dictionary and look the word up, to see where he went wrong. But alas, unless some reader recognizes the word, it will never happen -- after all, to find it in a dictionary...I'd have to know how to spell it. No, no, your host isn't abandoning the blog, far from it. But an announcement is long overdue, especially since events are about to overtake SC, and so we might as well get on with it. Longtime readers are well aware that Mrs. SC is a medical student. In about a week, this will no longer be the case -- she will finally graduate, and be Dr. Mrs. SC. Since readers know her only as Mrs. SC, traditional practice will continue. Yes, this is psychologically traumatic. Now SC will finally have to track down the gentleman who beat him by a number of years to the license plate "RADR HTR" ([that's not an expression of your host's hate for radar -- ed.]) and do the deal. Now he'll have to go to Padre games by visiting the dreaded Dodger Stadium. Now he'll have an easy time driving to colloquia at UCLA and USC. So it's not all bad. But perhaps worst of all, he'll be abandoning his beloved Chez SC. Yes, there have been many things to grouse about, like sprinkler installation and piano-abusing neighbors, but one gradually comes to feel a certain sense of pride in backaches past when the sprinklers are humming along, and even to enjoy exercising one's stereo at the neighbors' obvious invitation. So your host will be moving in June into a university-owned apartment, which is a big step backward from home ownership ([you mean "bank owneeship" -- ed.]). While the new place is not quite as devoid of conveniences as universities generally take pleasure in making their housing -- the place has a dishwasher, and is not visibly infested with anything more grotesque than graduate students -- it would feel very, very wrong to refer to this temporary abode as Chez SC. Rest assured that your host elready had solved this dilemma by the time the ink was dry on the rental agreement -- as of mid-June, SC will be officially living in Victory Mansions. "We're going to save, I guarantee you, $5 billion for the state because of this election we're going to hold," the governor said, later asking for SAIC employees to sign his initiative petitions. He did not explain how the money would be saved. That last part is a tendentious way of looking at it, based on how one defines "explain". If they mean by explanation that his immediate answer to that question did not include a detailed account of all of the line items in the state budget that would change, then the sentence is correct. But if they had quoted what came right before in his answer -- an analogy to the recall election of 2 years prior, and the budget changes he explicitly referred to as having resulted from it -- then considering that he had spent his entire speech arguing for what's on the ballot initiative, then it was a wholly unreasonable way of reporting the exchange. The nurse who asked him the question that resulted in this report explicitly indicated her satisfaction with the answer at the time. There is, of course, plenty of room for reasonable people to disagree about Gov. Schwarzenegger's budget plans; Radagast has been a very vocal opponent. But whether or not one agrees with him on the outcome of his policies, reporting the content of the conversation shouldn't be that hard to get right. As for the fact of the speech happening at SC's office at all, let your host assure you that nobody he knew had any idea it was coming until just a few hours before. What a surprise! Arnold Schwarzenegger just spoke at your host's office. SC had no idea this was coming -- it was only announced here this morning. More on it later; if the San Diego Union-Tribune has an article about it tomorrow, I'll link to it. All right, this is the part where I inflict the travelogue upon you all. 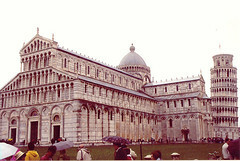 Rather than an extended series of posts where I drip photos of Italy out over the course of several days, this is an invitation to visit my newly-established Flickr site, and have a look at the photos I've selected so far. A major thanks to Radagast, who guided me through the whole process. 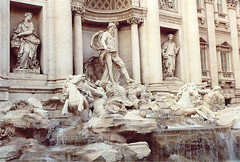 That's the Trevi fountain in Rome. Like many Italian and Roman works of art, a copy of it can be found in Caesar's Palace in Las Vegas. Unlike many of the others, the real thing is far more impressive than the copy. If you only see one fountain in Rome, this is as good as it gets. 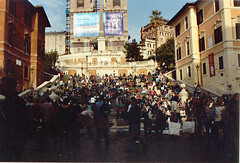 That means it contrasts especially favorably with the Spanish Steps in the Piazza di Spagna. A 3/4-scale replica of the Steps can be found at the Carlsbad Company Stores in San Diego. If you've only got two days in Rome, well...overratedness, thy name is "Spanish Steps". 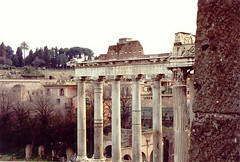 The inscription on the arch reads "Senatus Populus Que Romanus", which means "The Senate and the People of Rome". Despite the fact that the Roman Senate has been out of business for a millenium and change, the Italians like this inscription so much that it can be found everywhere in Rome: on manhole covers, on electrical transformers, on street signs. The only inscription that comes close to competing with SPQR is "Pont. Max. ", which is short for "Pontifex Maximus" in Latin (and conveniently, also "Pontifice Maximo" in Italian), and starts off every plaque commemorating the fact that something or other was built/remodeled/visited/thought about during the papacy of whoever's name follows it. The range of objects that "Pont. Max." is inscribed on is surprisingly large, and not limited to buildings and other major installations. One suspects that Pont. Max. would even be on the manhole covers as well, were SPQR not taking up so much of the available space. 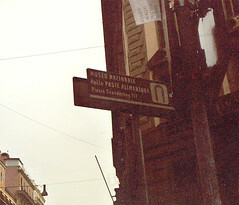 On a lighter note, I took this picture of a sign in Rome directing you to the Italian National Museum of Pasta. If I didn't take the picture, you wouldn't believe I was serious. If you go to the site linked at the beginning of this post, you can also have a look at: Priapus, who the Pompeiians considered a sign of good luck (look closely, but consider yourself warned that the mural in the picture is a bit dirty); some additional Pompeiian ruins; my favorite detail from illustrations of the Book of Revelations in the main Florence cathedral's baptistry; the Venetians' pre-blog solution to anonymously griping about people; and a dozen more. I'll keep adding things as time permits, but I won't fill up too much space here with travel photos. Which isn't to say that I'm done writing about Italian, or Italians. For those who care about technical details, the above photos were all taken in glorious 100% analog, with a Contax RX using a Carl Zeiss 28-70 zoom lens, on Kodak HD 400 film. The prints were scanned with an HP 4400c, to be supplemented shortly by a notably higher quality Konica Minolta DiMAGE 5400 film scanner. Conversion to JPEG -- but absolutely no other retouching -- was done with Adobe Photoshop Elements 3.0. One -- and only one -- post on cameras and photo technology will also follow.